Gerard Vroomen raises a very good point on his blog that others have mentioned on Twitter in recent days too: if the Katusha team is rejected from the UCI’s World Tour on ethical grounds why did the Licence Commission say the team is free to apply for a lesser Pro Continental licence? Surely a team could be in the second division because it has weaker finances or less ranking points, but not because it has looser morals and easier ethics? The wording is identical and nobody gets a prize for pointing out the spacing between words is different. Note the definition of ethics includes contractual and financial issues such as accounting for the money spent. In a rulebook identical words have have an identical meaning. If so then Katusha’s rejection from the World Tour means it’s out of the second division too and 2013 will bring no more than club races in Russia. Unless it can persuade the Court of Arbitration for Sport to rule it back into the World Tour, a strong possibility. The team is appealing to the CAS and started a timetable but this goes on hold over the holiday period. The clock starts ticking in 2013 but it seems unlikely that an expedited hearing will take place to fix things before the Tour Down Under now just 30 days away. I admire observant readers but that’s not in the rules, sorry. I realize I am nitpicking here but the UCI comittee said ‘free to apply’ not ‘free to join’ surely an application for Pro Cont status could also be rejected on the same grounds no? Let’s say the UCI gave Katusha some extra time to sort out some daylight-shunning business, if they want to, if not they’re out of pro-cycling at all. That is of course assuming none of this is personal nor political. Yes. We saw Lampre given more time in the past to get things in order, in 2009 we started with 17 teams and Lampre finally got its licence. This case today seems a step beyond, the Licence Commission has ruled out Katusha. Now as you say things could be fixed and they will be let in but perhaps this will have to come with conditions, whether a change of staff or other things. For now we’re still in the dark about the licence but I just wanted to follow-up GV’s point on ethics and state there is no know difference between World Tour and Pro Conti. 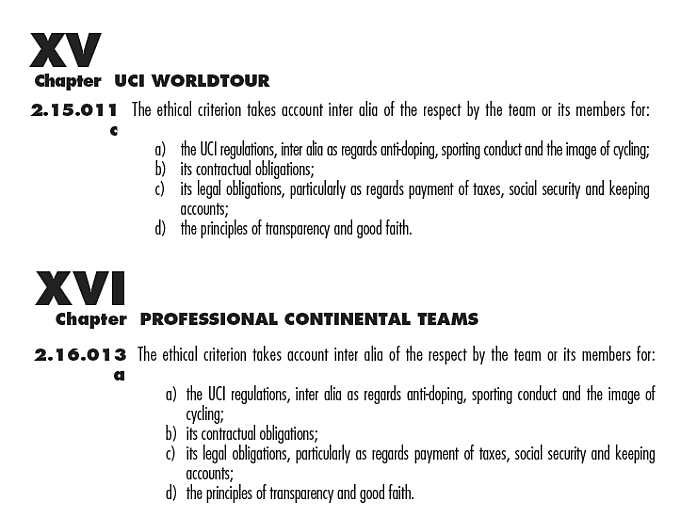 I think that the rules allow any team rejected from the World Tour for any reasons to apply for Pro-Conti status. They can apply and be rejected again if there is no change in their personnel and documents (much as Pegasus was repeatedly rejected for economic issues). Has a date been set for Katusha’s CAS appeal hearing? Should be interesting. I think there might be a difference in font size. Does that qualify for the jersey competition? Katusha most likely will get its license by end-of-january, – if the UCI License comittee can´t explain exactly on which ethics they fail. However firing Holcher and hiring Ekimov is not the best sign of compliance to ethics, – maybe Ekimov should be open about the past. What, and give back that nice new Gold medal? It seems obvious that this is a power play and is about politics and the people who control Katusha. After all, how can having Ekimov on the team and a few riders caught doping keep them out when many other teams have staff and riders with similar pasts? Can the dual standards withstand the scrutiny of the CAS? This an interesting thing. Ekimov has never tested positive, he’s never confessed and so on paper he’s Mr Clean. Now you or I might have views but a system like the Licence Commission has to review the facts rather than weigh up hearsay otherwise in no time the UCI could start accepting preferred teams, being lenient with riders who make donations and the rest. If he is Rider 11, like has been suggested, then ‘on paper’ (USADA paper) he might not be Mr Clean after all. 2) Does the UCI state what changes need to be made in order to qualify for a license? For example, if ethical grounds are the reason they didn’t get it, do they state something like, “If you wish to come up to ethical standards you must fire Ekimov, subscribe to internal testing by one of three independent, accredited doping science organizations, etc.”? He’s said he’ll stay… but he’s also said he wants to do the big races. We’ll see where the CAS appeal goes. His problem is that this is all so late, many teams don’t have room or the budget to hire him. Plus he is unlikely to come by himself, he would want to take a team mate and maybe some staff with him. So he’ll stay so long as the team does not implode and he should be a good draw for wildcards. As INRNG says, just not sure what team will be able to afford him – and guarantee him as TdF leader with a realistic chance of helping him win. I’d argue that there are only a handful of teams that can really help make that happen for him. Suggest that these are the main factors before even thinking of him being able to take anyone else with him. Nick: the UCI could not establish what Katiusha should do to overcome its failure to meet whatever criteria they have failed to meet, because this is a competition. 19 teams for 18 places. It would be very strange: “if you fire Ekimov, and Kolobnev, and recover Galimzyanov’s salaries”, we will throw Argos or Saxo out of the WorldTour. You can’t do that, can you? I’ve no doubt that Rodriguez alone will get them wildcard entrances to at least the Vuelta and the Giro (as current points jersey holder) but he’ll need a team to do it in so nervous times for him, although, late or not, his UCI points and last season would surely have any number of wealthy team backers jumping in front of him if its still allowed? smells really of manoeuvring and politics behind the scenes or maybe Katusha drew the short straw with the UCI arbitrarily deciding they should probably pull one team out of the ranks and shoot them for good measure.. Again they implicate themselves by a lack of transparency. Note the team still has no licence, not for any level, yet. Squeaky bum time for Purito and Katusha then, though as it’s been previously said on here, teams have still been granted licenses into Jan and even Feb, though this is just more uncertainty for sponsors and riders that they and the UCI don’t need. It’s really something that should’ve been cleared up by Christmas.